Microsoft Surface Go is one to keep an eye on. Alright, definitely early days but the excitement cannot be halted. 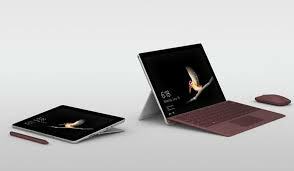 In the early hours of 10 July 2018 Microsoft unrelieved their new surface in a smaller form factor. Surface Go. What makes this more interesting than any other surface is the form factor. It is keeping what everyone has loved about the surface up till now; the kickstand, the multitasking, the colourful keyboards and the ability to run full Microsoft software. Win-win. Ok, it’s not that smaller from its big brother. With a 10 inch display, the Microsoft Surface Go only cuts off 2.3 from its big brother the Surface Pro which puts it in an exciting category. Yep, you guessed it, right next to the Ipad. But this isn’t a comparison review, in fact, it’s one that highlights why the Surface Go should be giving its much-needed attention at this point in time. There’s been so much to love about the Surface since its first revealing in June 2012. But if we are honest, the market was crying out for a tablet which could do all that we wanted it to do. Whether its to play games or become are laptop replacement/ companion. None where available, till the Surface came along. Fast forward a few years with a lot of criticism and uncertainty, The Surface has proved many wrong, and rightly so. It is a need, it is a must, it is what we have been seeking for a long as we can remember. But what makes the Microsoft Surface Go to consider amongst many others? Well, to start the usability of some of the most used functions ever; that’s right Microsoft Suite. Yes we know, you can download application versions, but there is nothing better than having the full suite in a laptop format keeping to the traditional way of working. However, the suite will be an additional cost with the keyboard/ mouse etc. This can push you back an extra £200 making this an investment you would want to utilise. Unlike anything else, the Microsoft Surface Go is the perfect partner for your out of home use. With its ease of storage, the ability to put it in several angles for better viewing, the Go may not be able to replace what you already have, but instead compliments your current set up. So if you’re looking for a laptop replacement, then this isn’t it. But a tablet that has the same functionalities as a laptop with a smaller form factor and less power? Then look no further than the Microsoft Surface Go.